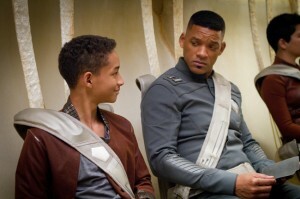 ‘After Earth’: Will Smith and son can go home again, but should they? NEW YORK (CNS) — You can’t go home again. So, at least, the title of a 1940 novel by Thomas Wolfe admonishes us. That’s a bit of advice the characters in the grueling sci-fi adventure “After Earth” (Columbia) — not to mention the real-life folks behind this plodding project — would have done well to heed. Set 1,000 years after humans have been forced to evacuate their environmentally despoiled home planet — get the message? — director and co-writer (with Gary Whitta) M. Night Shyamalan’s coming-of-age drama finds its two leads inadvertently revisiting this crazy old world by way of a crash landing during an intergalactic military mission. Needless to say they don’t exactly get a warm welcome. While the absence of homo sapiens has permitted nature to return to a flourishing state, it’s now full of people-averse predators. That’s bad news for Gen. Cypher Raige (Will Smith) and, even more so, as things develop, for his teen son, Kitai — played by Smith’s real-life son, Jaden. What with their downed spacecraft scattered all over the once-again-wild landscape — darn those destructive meteor showers! — and the rest of its crew dead, and Dad temporarily disabled … well, the only way out of this pickle is for Kitai to embark on a maturity-earning quest to retrieve the signal beam that represents the surviving duo’s only hope of rescue. It’s not a journey on which most viewers will enjoy accompanying him. Think lions and tigers and bears sounded bad? How about poisonous leeches, a polluted atmosphere requiring inhaler hits every few hours and a ticked-off raptor with the approximate wingspan of a 707? As for a purely fictional breed of snarling monsters that prey on human fear — called the Ursa — the less said about them the better. The filial relationship at the heart of the proceedings — Cypher allowed Kitai to tag along on the expedition in the first place so the two could bond — is ultimately characterized by self-sacrificing love. This, despite the emotional conflict resulting from a family tragedy we glimpse in flashbacks. But the warrior code by which Cypher lives — and which he strives to instill in Kitai — seems to have more in common with Zen Buddhism than with the values promoted in Scripture. Thus Cypher repeatedly insists that Kitai become intensely focused on, aware of, and at one with his surroundings. And the only way to overcome those pesky Ursa is to “ghost,” that is, to render yourself entirely free of fear. The script’s glib portrayal of the bonds uniting veterans, moreover, will strike at least some moviegoers as either jingoistic or exploitative. The film contains much action violence, some of it bloody, gory medical images, a stifled crude term and a few mildly crass expressions. The Catholic News Service classification is A-III — adults. The Motion Picture Association of America rating is PG-13 — parents strongly cautioned. Some material may be inappropriate for children under 13.